This exercise is fairly simple. It is a good first step for any Manager and does not require advanced understanding of Time Span. This is an intuitive judgment. Step One is to make a scratch list of those people who directly report to you. Step Two, based on what you currently understand about Time Span, rank your list from longest Time Span to shortest Time Span. This does not require specific identification of Time Span, but only relative Time Span assessment, one person to the next. This method is more complicated than the Ranking Method, however, it reveals specific assessments related to Time Span. The Gearing Method uses the Job Description as the starting point, but requires two additional elements. 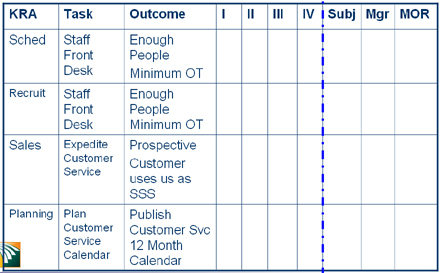 Defining Time Span for each of the major tasks on the Job Description. Evaluating the Effectiveness of the internal candidate related to each of the major tasks. This Job Description is for a Customer Service Manager and we are focusing on four Key Result Areas (KRAs). 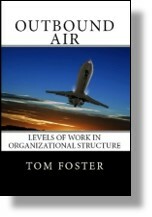 As part of the Job Description, the Tasks and Outcomes have already been defined. Most Job Descriptions work well as the basis for this step. 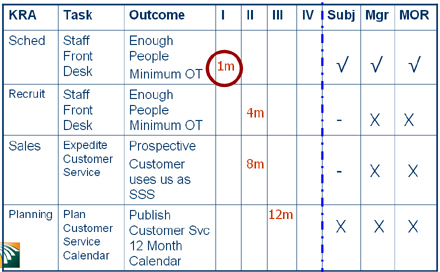 By thinking through the tasks involved and the outcomes expected, the Time Span for each KRA can be defined. So, what is the Time Span for the Key Result Area called Scheduling? Answer: 4 weeks or 1 month – Stratum I. The goal will always lead you to the accurate Time Span for the task. When the Time Span for a task is difficult to figure out, always go back to the goal. Defining Question(s): How many months does it take to identify understaffing, create a job description, post ads, schedule and conduct interviews, make a selection, orient and train the recruit to the point where they can solo at the position? The goal is to have the new person expertly handle all customer inquiries without assistance, solo. Defining Question(s): How many months does it take, providing high level customer service to move a prospective customer to where they see our company as a sole source provider for their needs? The goal is for the prospective customer to see us as sole source provider. Defining Question(s): How many months does this plan contain? The goal is to create and execute this plan. Once Time Span has been identified for each Key Result Area, the next step is to make an assessment of effectiveness. To make the evaluation less subjective, we will use multiple data points: a self assessment by the Customer Service Manager, an assessment from his Manager and one more assessment, up the food chain, from the Manager Once Removed. The Assessment contains three possible scores in each area. Thumbs Up = Subject is effective using their discretionary judgment and exceeds prescribed performance. Neutral = Subject meets only minimum standard for prescribed duties. Thumbs Down = Subject does not meet minimum standard for prescribed duties. You can see the assessment in each of the Key Result Areas. You tell me. What is the effective Time Span of this individual related to his job duties? Once you have laid out the Job Description and made assessments in each Key Result Area, the evaluation becomes very clear. This person has demonstrated capability at a 1 month Time Span. He should be clearly capable of tasks in High Stratum I, but will likely have difficulty with longer Time Span tasks. As his Manager, you now have some decisions to make, but you also have some concrete data to help.